Is it December already? Seriously, Time! Pull those reigns in! You’re running away from me! As the holidays roll around, it’s usually a startling reality that the year has flown by, usually in a blink of the eye. Christmas, like weddings, always seem better in concept than in reality. An entire day dedicated to love, fellowship, and joy? Sign us up, right? But people are usually wildly stressed out and haggard by the time the actual day rolls around. The planning, shopping, organizing and trying to corral everyone together can be a big fat energy zapper. Ask any bride planning a wedding or a mother trying to get things in order for the holidays. I’m not saying it’s all a miserable experience, because big events (like Christmas and weddings of course) often bring huge amounts of joy. It’s the days leading up that often cause us to focus on anything and everything but our current time and place, and to soak it up and enjoy it. I personally despise the mall and would rather trek through Dante’s Inferno (all and any levels) in bare feet rather than to endure shopping during the holidays. Let’s be real, people lose their minds and it’s more like an installation of the Hunger Games than Miracle on 34th Street! Save me, sweet baby Jesus! I do believe it’s a huge challenge to stay present and to cherish each day as a sacred gift. The simple truth is, each day is a gift…and we know that in our heads, but we must live it in our hearts. A current Instagram yoga challenge by Kino Macgregor (yoga goddess extraordinare!) is to “Just Be Present,” represented by different asanas and a slew of hashtags. While I think the yoga challenge in and of itself is just fabulous, I love the emotional and mental challenge as well. May we do this together? Here’s my goal: I am going to make sure at several points throughout the day to stop, look, and listen (grade school style!). I will use my five senses to fully catalog what I’m experiencing. It can just be for a few moments at a time, but the goal is for me to have a collection of very distinct memories at the end of the day. 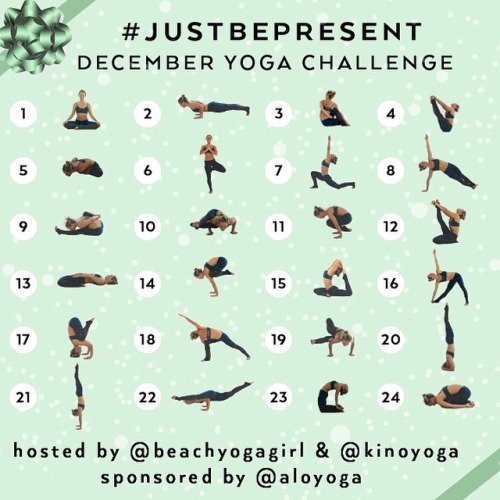 I’ll be posting my “Just Be Present” pics here throughout the month along with some of the things I’m learning along the way, but feel free to join me and other yogini’s that are a part of the the wonderful yoga community on Instagram. Much love and namaste!